The Active Particle-induced X-ray Spectrometer (APXS), carried by the Yutu rover of the Chang’e-3 satellite got its first X-ray fluorescence spectrum of lunar regolith around the landing site on December 25, 2013. An initial analysis indicates that eight major rock-forming elements (Mg, Al, Si, K, Ca, Ti, Cr and Fe) and at least 3 minor elements (Sr, Y and Zr) of the Moon can be identified in this spectrum. 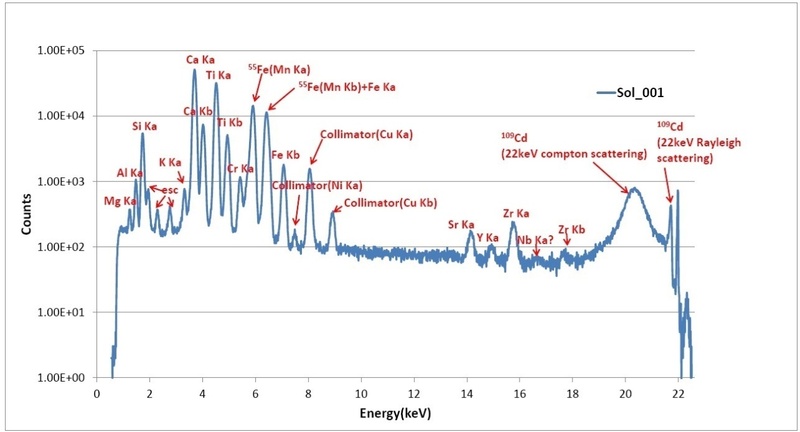 Besides, the energy resolution of AXS is estimated to be about 135 @5.9keV, which demonstrates that it is currently one of the best X-ray spectrometer for the planetary exploration in the world. APXS was firstly powered on December 23 and an in-flight calibration of a standard basalt rock sample mounted on the rover was accomplished in five minutes, which proved its stable performance on the Moon. 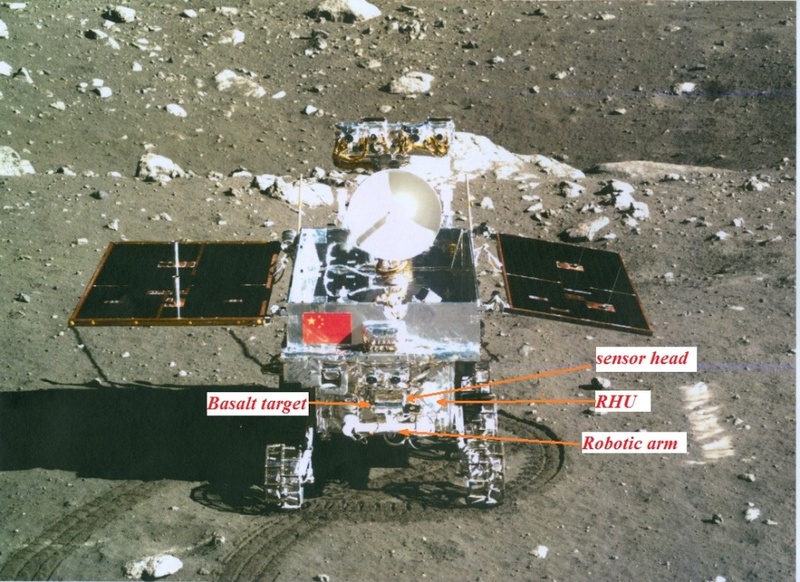 Two days later, APXS was successfully deployed to about two to three centimeters above the lunar regolith surface by the robotic arm of Yutu and started the detection mode. 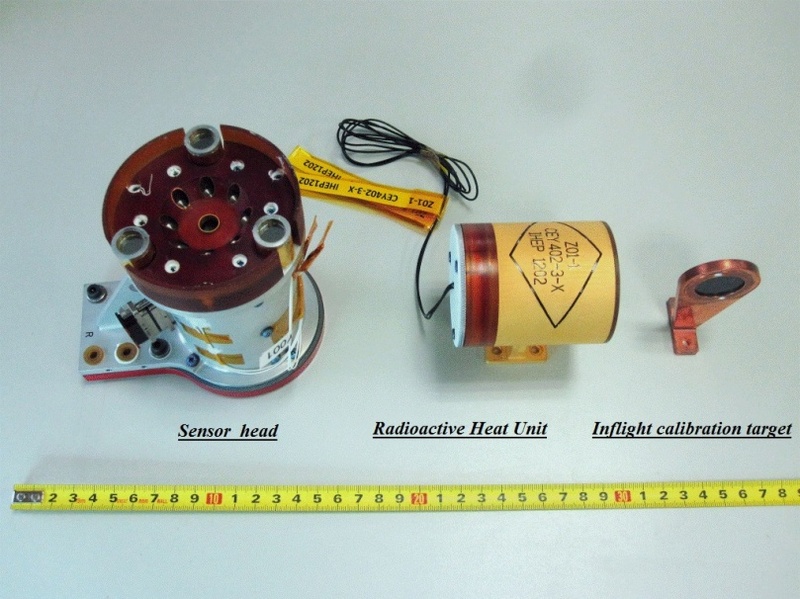 APXS was not only an X-ray spectrometer, but also served as a distance sensor during the deployment by making use of X-ray count rate varied with distance. The Institute of High Energy Physics (IHEP) developed APXS in collaboration with the Purple Mountain Observatory (PMO), CAS. Prior to the APXS on Chang’e-3, two X-ray Spectrometers onboard Chang’e-1 and Chang’e-2 developed by IHEP scientists were launched respectively on October, 2007 and October, 2010.